This article was written on December 30, 2014. The Battledome may be subject to change after the date of publication. State of the Battledome is back in time to summarize the last quarter of the year. Since the last edition of State of the Battledome the site has experienced a rough server transition, a large 15th birthday bash, another Games Master Challenge, and a small seasonal event. However, in terms of the Battledome, the last three months of the year have been much like the first nine: nearly devoid of Battledome updates and content. Still, we briefly look back at the fall and the year as a whole before looking towards 2015. Birthday Cupcakes - More Cake Controversy? 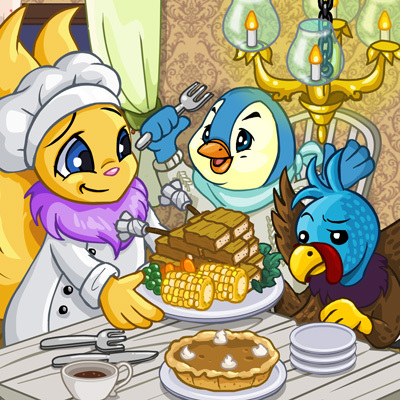 During a jam-packed Neopets 15th Birthday week in mid-November, one of the major surprises for battlers was the addition of a sweet surprise for pet birthdays. On a pet's birthday, the owner can view the pet's Pet Lookup to receive the choice of a red, yellow, or blue birthday cupcake. When fed to a Neopet, these birthday cupcakes will boost the hitpoints, strength, or defense of the pet by five depending on the colour of cupcake selected. The cupcake can be fed to any pet on the account, but the cupcake comes with No Trade status, meaning it is bound to the account on which it was received. 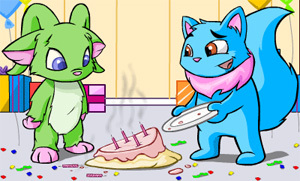 Controversy arose when several Battledome chatters noted that additional birthday cupcakes could be attained by adopting pets from the pound (and then discarding the pets back to the pound) as well as by creating new pets celebrating their "0th" birthday (a new pet can be abandoned seven days after its creation). Although using pets in this manner goes against the spirit of the game, no rules are in place prohibiting the practice. The week after release, the Neopian Times Editorial did request players use the cupcakes as they were intended, but it did not explicitly state that cupcake abuse was against the rules. The editorial response shows that the potential for abuse was an oversight in the implementation. If the "0th" birthday were not treated as a birthday, players would not be able to create pets for the sole purpose of getting the cupcakes. However, this would likely require coding to revise the way the cupcakes are awarded. Alternatively, the stats could be awarded directly to the birthday pet, entirely eliminating the issue, but this solution removes the original idea of a birthday treat item. A number of solutions to this issue seem feasible, but the Neopets Team has only requested that players use the cupcakes in good taste. Not long after the introduction of the cupcakes, the age and birthday of pets currently residing in the Pound was removed. This change eliminates some of the potential for cupcakes to be over-consumed. Like the Neopets Team, I also encourage users to use the cupcakes only in the birthday spirit, not as an additional accelerated training device. The Neopets Team made sure that the site's 15th birthday would be memorable. The entire week featured XL-sized daily news, or in other words the New Features resembled the news updates of a decade ago when Neopets was what the cool kids played in their middle school computer labs. Although the "big surprise" at the end of the week was not as earth-shattering as many players would have hoped (a mobile version of the site would be nice at some point), smaller updates throughout the week left the majority of users satisfied. The prize pools for several dailies were revamped, helping to create renewed interest in them. However, Pirate Draik Morphing Potions were added to both the Forgotten Shore and Anchor Management, leading to a massive deflation of Draik Morphing Potions and contributing to the ongoing concern that many site achievements are becoming too easy to accomplish. Several new avatars were added as awards for winning the Site Spotlight, the Beauty Contest, and the Neopian Lottery. These new avatars added additional purpose to areas of the site that had lost popularity over the years. The big surprises for battlers arrived on Wednesday and Thursday, when Trading Post and Auction transaction limits were increased and the restock system was given a lift. With a new Trading Post limit of 2,000,000 NP and an Auction limit of 100,000,000 NP, high-end battle equipment can now be exchanged much more safely. No longer will Leaded Elemental Vial, Thyoras Tear, and Ghostkersword sales involve risky split trades or junk auctions. The restocking update was also big news for battlers. Shops will now periodically wipe clean of all their items as a solution to the growing problem of undesirable items crowding the shops. Initially the shops seemed to clear out at frequent intervals, but at the time of this writing it now appears that the wipes take place at a rate of about once an hour. In turn, an update this month expanded the shop capacity to 48 unique items, twice the original number. The new restock system has a number of effects on battling and training. For starters, Kaylas Potions will now stock more stat increasers as the shop will no longer be crowded with junk items. In the same sense, many weapon shops such as Defence Magic and Faerie Weaponry will now stock useful or profitable weapons more often. Shops such as Royal Potionery and Collectable Coins will not be greatly affected as these shops already had spare room for items to stock in the old capacity of 24 items. Food shops will also be able to stock Kitchen Quest foods more often, potentially making these quests cheaper to complete. It should be noted that long-term deflation is a notable concern of the new system, but at this point the system has not been in place long enough to truly gauge its impact. The past three months have been quiet in terms of weapon releases. Since the release of Maractite Bomb in mid-September, Holiday Nova may have been the best weapon released, a testament to how poor the sporadic weapon releases have been in recent months. With the New Features announcing that the Neopets staff is on holiday for two weeks, we can safely assume that the next major weapon release will take place in the New Year. With this acknowledgement, Maractite Bomb will remain the only Smuggler's Cove or Hidden Tower release of 2014. As seen in the chart below, this year marks the first time since 2008 that only a single Cove or Tower weapon was released. Although it is disappointing that this year was almost devoid of weapon releases, it was to be expected given the dormant new Battledome. Considering the mixed reviews on Maractite Bomb, Oasis Tonic is arguably the only impactful weapon release of 2014. Given the Healing Scrolls' susceptibility to inflation, Oasis Tonic offers some stability should another site-wide battle event ever take place again. If we wanted to scrape the bottom of the barrel we could say that February's Brightvale Potions have L97 potential but anything past these potions is impossible to view favorably. On the bright side, Neopian Times Editorial 669 does mention the possibility of a cheese-based Hidden Tower weapon in the near future. The last time the editorial answered a request for a new Hidden Tower or Smuggler's Cove weapon one was released approximately five issues later. If history is any indication here, we may see said cheese weapon in early January. Given the rock-bottom year for weapon releases, 2015 almost certainly must be better. After all, the bar of expectations will not be difficult to surpass. League 97 has enjoyed more success than any other 2-Player organization in the new Battledome, having operated ten official tournaments over two years with numerous casual events. Over 150 players have tried their hand at L97 play, but after two seasons the metagame is beginning to grow stale. In an effort to give active players a new experience and attract new and returning players alike, League 97 is currently hosting an open debate on the Jellyneo Forums. The league plans to implement several new rules for the 2015 season that will enable a handful of new weapons to be used while still retaining the core philosophy of defense-based, 10-12 turn battles. Both veteran L97 battlers and curious newcomers are encouraged to provide input on the types of weapon additions they would like to see implemented for the 2015 season. As 2014 comes to a close, it is time to regretfully admit that the Battledome was an afterthought throughout the year. With the exception of the challenge glitch fix in September, battlers received nothing to rejoice about in 2014. The excruciatingly long wait for a more playable and competitive Battledome continues into 2015 as glitches persist, HP increase is nowhere to be found, and the Faerie Ability system offers little in the way of strategy. For battlers, 2015 will begin much like the year before with an ever-dimming faith that the Battledome may one day be fixed. The Neopian Times editorial only recognized questions regarding the status of the Battledome only three times this year, and it has not recognized a question since July. The last response stated that the Battledome was not a priority, and the lack of communication since indicates the Battledome is unlikely to be a priority in 2015. Still, some signs point to an optimistic future. Although the JumpStart acquisition has been both puzzling and rocky at times, many players feel that good times are ahead. It appears that JumpStart is in the process of revamping its own website, and Neopets' existence is now at last acknowledged on the site. Barring a tumultuous item exploit in September and a mysteriously lengthy lag spell in December, the JumpStart tenure has produced a modest amount of excitement and optimism in its first few months. Several small but well-placed site events, most notably the Charity Corner, have helped keep interest levels up while the site is being patched up from the server transition. JumpStart has also shown off early efforts at reviving the Neopets brand with the MadeFire partnership and a mobile app coming soon. Both the Battledome and the Neopets site as a whole still require a significant amount of work, but the JumpStart ownership presents new hope for proactive updates and repairs. While there may be little reason to believe in any approaching Battledome updates, a general feeling of optimism does allow for the possibility of a surprise fix or patch. If JumpStart wishes to bring Neopets anywhere near its former glory, a properly functioning and strategically-enriching Battledome will surely be a necessity. The small community of remaining battlers will once again hope the coming year will be worth the wait. This page was last updated on April 18, 2019.